What is Social Selling vs. Digital Selling? We ask Tricycle's founder. On April 12th, Sociabble is honored to be taking part in a panel discussion at the Tricycle Europe Digital Selling Summit in Amsterdam. The summit is designed to tackle the influence of new technology, AI, and social media in the current online marketing landscape. Representatives from Accenture, Microsoft, Signify, and Tricycle are all going to be participating as well, in what promises to be an extremely engaging conversation. 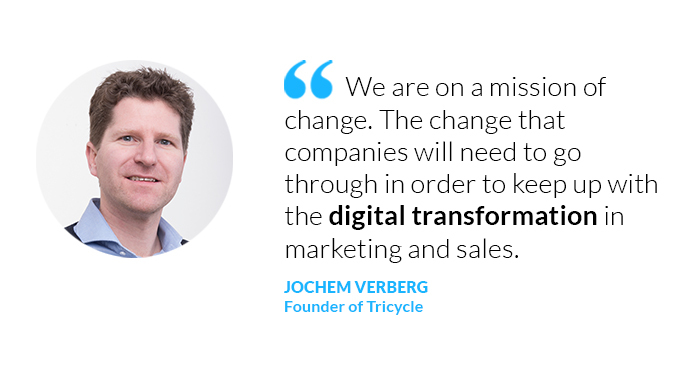 To answer the question “what is social selling vs. digital selling?” and to better understand the changing world of online marketing prior to the event, Sociabble sat down with Tricycle’s own Founder, Jochem Verberg, for a friendly chat. What follows is part one of the interview. Thank you again for joining us, it’s a pleasure to meet. The first question is, can you tell us more about the mission of Tricycle? We are on a mission of change. The change that companies will need to go through in order to keep up with the digital transformation in marketing and sales. We believe we can help international companies to adapt to this changing world, by understanding technological developments and cultural diversity around the world. And digital transformation obviously involves adaptation. And when it comes to adapting, companies certainly don’t want to get left behind. Exactly. And when it comes to technology, our mission is really to help companies in this way, to be able to adapt constantly. A couple of years from now, maybe 10 years from now, if as a company, you have not changed, you’re going to be left behind, you’ll become a dinosaur if you don’t evolve. And that’s our mission, in the end. We also have a big hairy goal, that we want to help 500,000 people in the next 10 years to adapt to this new way of doing business. Of course, this is a big thing, but we see quite a bit of potential in just the marketing and sales universe we’re in. That’s what we care about. Okay, perfect. I guess a follow-up question is: who are some of the clients you’ve worked with, and what are some of your proudest or most memorable achievements working with those clients? Well, we’ve worked with a lot of clients already. We’ve been in business for 12 years, but let’s say the last five years, we are more and more taking this new direction, ever since social became more important for nurturing opportunities. Our biggest clients, for example, are Microsoft, Signify (formerly Philips Lighting), Accenture, and Citrix. It’s a lot of tech-service kind of companies. And if I look back at our company, let’s say 12 years ago, it was really focused on the Netherlands. We were based in Amsterdam. We did a few projects outside the country at first, and we took a really big leap a couple of years ago when we went global with Microsoft. That’s a big project that sticks out on our achievements list. To think, that Tricycle helped Microsoft from 2015, the beginning of 2015, to transform their marketing sales teams. First, it was on a regional level, and then transformed into something global. We’re talking about 27,000 sellers! At this time, we worked a lot with Sociabble together, because Sociabble was the platform they used. That’s how we got to know each other well, it was a shared customer. I think the really cool thing is that Microsoft, of course, bought LinkedIn while we were coaching all their sellers. That was in late 2016. I think being part of that transformation, where it went from Microsoft being a customer for LinkedIn all the way to Microsoft owning LinkedIn, and all the change that happened, that was a really incredible thing for us to be a part of, to be really part of something that big. That was cool! Think about it: they’ve been doing business for 20 years in the same company, and now they’re facing the social media stuff that’s happening around them, and trying to figure out what to do with it. That’s where our team can help. And we’re not only helping sellers anymore, we’re really helping executives as well. It’s not only about changing their behavior, but changing their mindset, of course. Tricycle is based in the Netherlands, where they have built a reputation as a leader in digital and social selling for global companies. That’s very interesting. It’s really changing their mindset so they’re better able to adapt and understand the revolution in social media and marketing technology and things like that. Yes. And I think that’s the external side where I’m very proud of our achievements. The other side is more internal. At our company, we now have a team of 40 people. But the most exciting part is that we have about 25 different nationalities on the team. In fact, we’re super international. That is so cool. I think if we’re talking about the client projects, that’s all fine. But for me, going to work every day, that’s the most rewarding part, when you walk into a company, and work with a team with all these different nationalities, all these different angles they take in trying to find solutions for problems—that’s pretty amazing. That’s something I really value, and I see that in our company every day. People from different cultures have different perspectives. If you bring them together and have a safe environment, then great stuff can happen. I think that’s even cooler than the big projects that we’re working on. 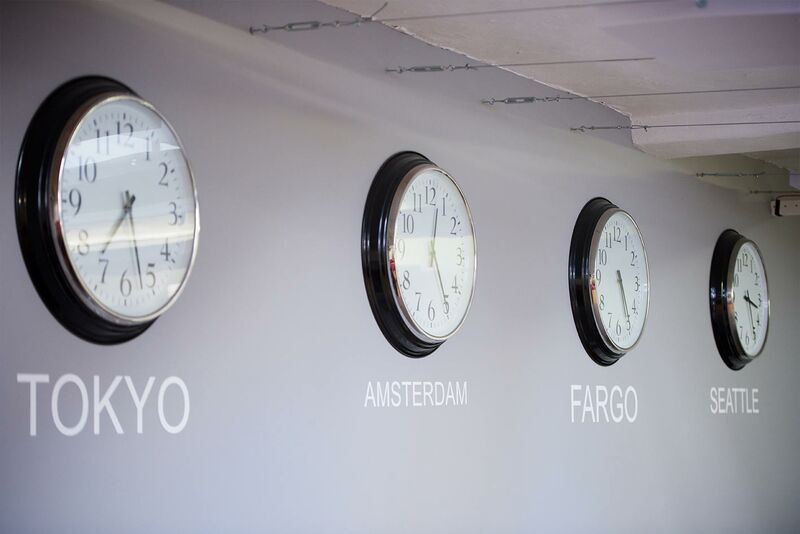 Tricycle prides itself in being a truly international company, one that celebrates the cultural diversity of both its employees and its clients. Wow, it sounds cool! We have a more specific question, as a follow-up. The upcoming event that Sociabble is going to be participating in is specifically about digital selling, not just social selling. Can you tell us more about that? What are the major differences in your opinion? What makes digital selling unique and different from social selling? Well, a lot because I think social selling is part of digital selling. Okay, it’s a larger family. Yes, that’s the simple answer. It is deliberately simple, because a couple of years ago, social selling was really something that every seller needed to be involved in, in order to keep up with their peers. If you were not using social selling techniques, then basically you were not doing as good a job as you could do. You just missed out. Now, after a couple of years, this has evolved. It is still important, of course, but if you take a look at the digital part, and think of a seller or a marketer, it’s in the same domain. The tools they have available, like the business apps for sellers and marketers, are growing by the day. On average, sellers are using more business apps to do their job. This is really important, if you divide the tools a seller has in their digital toolkit, you can basically divide them into three categories. One we talked about, obviously, is social selling. That’s a big tool. The other one is the CRM system, and then you have the productivity tools. CRM and productivity tools, that’s really more like the digital part of it. 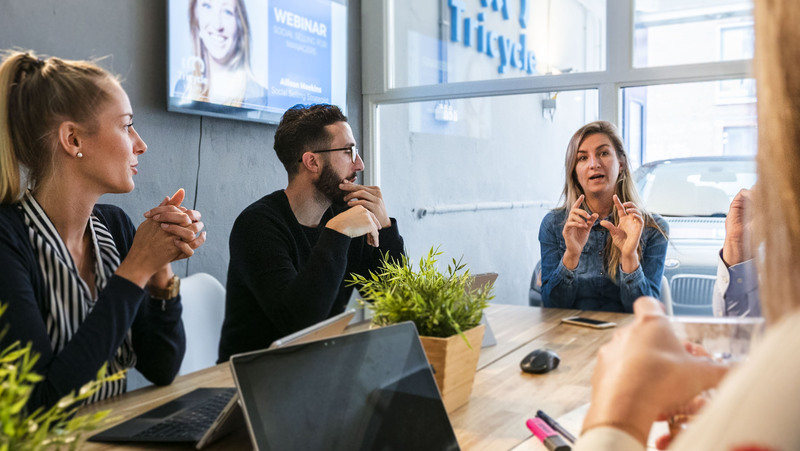 Since these tools are getting smarter every day, well, that’s why we’re talking about digital selling right now, because it’s all about the combination and the integration of social into CRM. I really hope that two years from now, we’re not talking about CRM anymore, nobody does, I hope, but that it will really be about social CRM. It should be one in the same, managing your CRM and your social should be one thing, because then you have all the data constantly updated, and you can work from there. Are there companies and industries that are already adopting this strategy, or that are well-positioned to do so in the future? You see that happening already with Salesforce, and of course, with Microsoft Dynamics, the integration with LinkedIn. Then you have productivity tools, especially AI tools, and then we’re talking about predictive selling, for example. And this has to do a little bit more with marketing automation. If a seller can use all these different tools, they can perform better. In the end, they can manage more accounts, more leads, and respond in a shorter amount of time. That’s what it does for them. We are really focused on helping whole companies and big companies, internationally. That’s what we add to this world, we look at a huge company like Microsoft, like Signify, like Accenture, and we find out how those companies can adapt to this changing world, and can adopt these new tools. That’s a challenge, because we’re talking about digital, it’s cool, but a customer in Brazil can be so different from a customer in Poland or in Australia. This concludes part one of the interview, “What is Social Selling vs. Digital Selling?” Check the Sociabble blog for part two, coming soon!